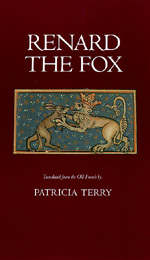 Renard the Fox is the first modern translation into English of one of the most important and influential medieval books. Valued for its comic spirit, its high literary quality, and its clever satire of feudal society, the tale uses animals to represent the members of various classes. This lively and accessible translation will be welcomed for courses in medieval literature and history, gender studies, and humanities, and will be a treat for the general reader as well. Patricia Terry has been Professor of Literature at Barnard College and the University of California, San Diego. Among her medieval translations are The Song of Roland and Poems of the Elder Edda.